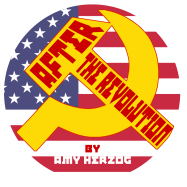 nj arts maven: Circle Players Presents "After the Revolution"
WHEN: Fridays: February 1st and 15th at 8:00pm; Saturdays: February 2nd, 9th, and 16th at 8:00pm; Sundays: February 10th and 17th at 3:00pm. A complimentary wine and cheese reception will be held following the opening night performance, and a talkback will be held following the Sunday, February 10th performance. WHERE: Circle Players, 416 Victoria Avenue, Piscataway. Please be advised: due to the unique layout of this theater in the round, latecomers cannot be seated after the performance has started. Please plan to arrive at least 15 minutes before curtain. For reservations, call (732) 968-7555, or buy tickets online at www.circleplayers.org. Emma Joseph is a bright, hard-working, law school graduate continuing her family’s business of fighting for progressive ideals. She founded the Joe Joseph Fund four years ago, named for her grandfather who was blacklisted during the McCarthy era for refusing to name names. A curveball comes hurdling Emma’s way, however, when she finds out that her grandfather may have been passing information to Russians while working for the US government—a fact that was hidden from her by her father for her whole life, and one that calls into question her whole ideology.